Photo courtesy of Svensk Botanisk Tidskrift, vol. 60, no. 3. 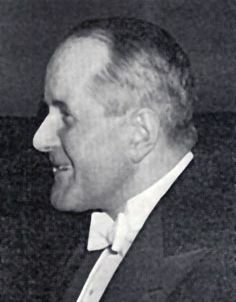 One of the twentieth century's most important paleobotanists, Rudolf Florin spent his entire professional career affiliated with Stockholm University. There he pursued research on the epidermal structures of living and fossil plants, particularly conifers and taxads. His unsurpassed knowledge of morphology in these (and some other) groups in turn laid the groundwork for systematics investigations involving both phylogenetic and biogeographic reconstructions. His studies ranged to considerations of floras all over the world, and temporally from the mid-Paleozoic on. One of his best known publications was his "The Distribution of Conifer and Taxad Genera in Time and Space," in which he posed various effects of the developed, and then disappearing, Tethys Sea. Much of Florin's evolutionary work was based on his adoption of Walter Zimmerman's telome theory. He was also a celebrated and honored conservationist, if mainly within his homeland only. --born in Solna, near Stockholm, on 5 April 1894. --dies at Falköping, Sweden, on 24 September 1965. --Taxon, Vol. 15(3) (March 1966): 85-93. --Phytomorphology, Vol. 18 (1968): 174-178. --Ameghiniana, Vol. 4(8) (1966): 303-304. --Plant Science Bull., Vol. 11(3) (December 1965): 11-12. --Historical Perspective of Early Twentieth Century Carboniferous Paleobotany in North America (Geological Society of America Memoir 185, 1995): 119-126.